Who says quiche is just for brunch? Europeans serve egg-based dishes at every meal. Serve this as a savory and satisfying addition to any cocktail party. Roll out pie dough and place in a tart pan with a removable bottom. Trim the excess dough by pressing the dough off at the top of the pan against the edge. For the filling, whisk together eggs, half-and-half and seasonings. Stir in the remaining ingredients. Bake at 350 degrees for 25-35 minutes. This Wild Mushroom, Chive & White Cheddar Quiche is part of my "Budget Friendly Holiday Cocktail Party Menu." 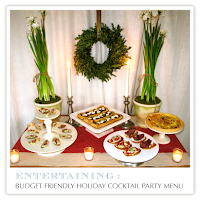 For all of the recipes and tips for creating a memorable, low-cost cocktail party, visit the "Budget Friendly Holiday Cocktail Party Menu" Page! Jenny, this quiche is gorgeous! Linking back to it today.